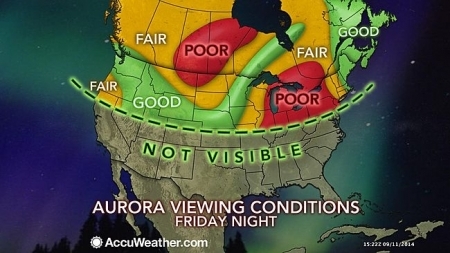 If you are hoping to view the Northern Lights in Philadelphia, there is a chance on Friday night, but the conditions may not be ideal. The moon is still bright, in a waning gibbous phase. There could also be partly cloudy conditions. The best place to view the Aurora Borealis is in any open area away from the city lights. Viewing is typically better after midnight but it is possible to see them anytime after the sun goes down. Remember to bring a camera.